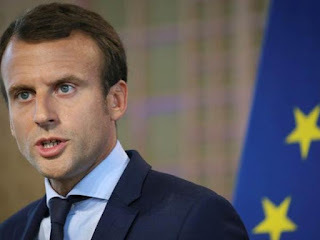 Emmanuel Macron on Sunday swore-in as the French President at the Elysee Palace after his resounding victory in the second round of the country's presidential elections. Macron has become the youngest president in France's history and the youngest leader since Napolean. Macron arrived at the Elysee palace on Sunday and walked down a red carpet. He was greeted by outgoing Francois Hollande. Around 300 people including trade union representatives and Nobel Prize winners attended the swearing-in ceremony of French President. President Macron faces a daunting task of reviving the economy and tackle country's high unemployment rates. The independent candidate won a resounding victory after crushing off far-right candidate Marine Le Pen with an overwhelming 66 percent majority. In his first speech as the President, Macron said "The whole world has watched our presidential election, the responsibility with which they have entrusted me is an honour".